It is no secret that quarterbacks from certain systems face a difficult transition to an NFL playbook, but how often do we discuss a tight end's conversion? Well, that is exactly the conversation that scouts are having about Andrews. If he were 30 lbs lighter, there would be no doubt that he was a wide receiver based on the position he plays at Oklahoma. 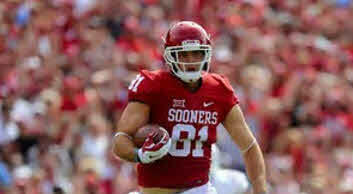 The problem is his athleticism and size dictate he play tight end in the NFL. With that being said, it will be a gamble for any team drafting him. Still, he is an intriguing prospect with very good size and an advanced approach as a pass-catcher. Andrews' looks the part at over 6'5" and 250 lbs, and he moves reasonably well. As I mentioned, his experience at Oklahoma is primarily as a receiver, where he has been Baker Mayfield's most reliable target. He consistently extends his arms to the ball and displays soft hands. He also plays with very good balance which is an underrated quality. Andrews is a good athlete but compared to a player like Mike Gesicki out of Penn State, he has a little stiffness to him. Because he doesn't have that ability to run away from the defender, it is all the more important for him to display good footwork and balance. This helps him get in and out of breaks quickly. Andrews doesn't run an extensive route-tree at Oklahoma, but I do expect his footwork and balance to help make his transition much smoother when he gets to the NFL. He also shows the ability to catch contested passes, which is a plus for a player that won't get much separation at the next level. While I mentioned that he does have good hands, he will occasionally drop passes, but it is usually a lack of focus. He gets caught thinking about what he is going to do with the ball in his hands before it is actually there. This will have to get better if a team is going to rely on him in the passing game. When the ball is in his hands, he may look stiff, but his straight-line speed is expected to be above-average. I doubt he will run away from most defenders, but he will make it difficult to catch him. His effect on the run game is still to be determined. Even as a blocker split out at receiver, he tends to run his opponent off as much as he attempts to block them. The balance and footwork that I mentioned should help him become an adequate blocker, but I have yet to see that mentality to be anything more than average in this area. It takes a physical nature to succeed in blocking, and I see more finesse than fight in him. Blocking will be something that elevates him into an every-down role or prevents him from it. Another area I am concerned with is him having to play in a three-point stance. It isn't the easiest thing to get a clean release of the line of scrimmage, and it is that much more difficult when you put your hand on the ground. It will take keen technique and practice, and also be necessary if he wants to compete for a starting position. Andrews has no red flags off the field and appears to be a good teammate. He does like to celebrate his catches, but I don't see him jawing with opponents which tells me he keeps his emotions in check. Tight ends are becoming like running backs in the NFL. Very few are complete prospects at their position but teams like a variety of talent at both in order to give their offense complexity. Andrews' abilities as a receiver can be molded into a playmaker at the position, but whether or not teams believe he can develop as a blocker will determine his draft stock. If not, teams will likely have an early day-three grade on him. If a team believes he can have an impact on every down, he could be selected on day two. Either way, teams better be comfortable with his ability to grow as a tight end if they are going to choose him.